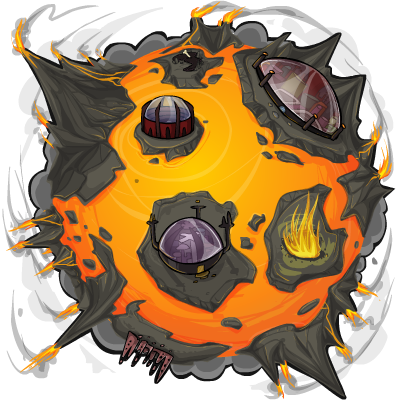 Welcome to Reiflem, the planet with a fiery attitude and citizens to match. Watch your step because one wrong move and you'll fall into the lava that surrounds everything. We don't have guard rails or anything. For one thing they'd probably melt being that close to the lava and for another our citizens have all agreed that railings are for the weak. Everyone here trains constantly to be the best, so we apologize in advance if they seem harsh. Otroe Circle is one of the coolest places on the planet. After all, we needed a place for visitors to buy our wares and sell theirs without getting heat stroke. The portal nexus is also a good place to go to cool off. The winds of Scria and water vapor of Atquati pour through their respective portals, providing a slow adjustment to the heat for visitors and an adjustment to the cold for our residents before they leave. Even if you are not one for heat, you really must venture out into it to visit our guardian, Otroe. Be polite to him as he is a true warrior, although a tad arrogant at times. He likes showing off his control of fire by keeping a familiar with him. He calls this fire bird Pyre and I would suggest greeting it respectfully as well.